The high-end apartment trend is fanning farther and farther afield, with a new luxury rental project now planned for Suwanee Town Center. Bisnow reports that developer Terwilliger Pappas will bring 240 apartments to the heart of Suwanee with their Solis Town Center. Construction on the project, located at the intersection of Lawrenceville-Suwanee Road and Buford Highway, will bring not just apartments, but 12,000 square feet of retail to central Gwinnett County. The six-acre site will also feature 71 for-sale townhouses by CalAtlantic Homes. 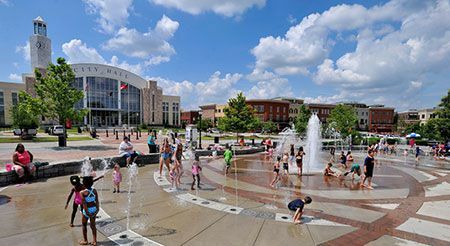 Suwanee is the latest to capitalize on the creation of walkable urban nodes in the far-flung suburbs of Gwinnett County. Planning is underway on a range of projects, including a major mixed-use development surrounding the Infinite Energy Center and plans for more construction in downtown Lawrenceville. Not limited to Gwinnett, the trend is also overtaking cities far outside downtown Atlanta: Kennesaw, Alpharetta, and Johns Creek are also quickly becoming desirable for developers looking to delve into upscale multifamily. While Atlanta’s core is experiencing a renaissance, expect to see walkable nodes keep popping up all over the region.